An inner court of the Palace, Ulwur. bl.uk > Online Gallery Home	> Online exhibitions	> Asia, Pacific and Africa Collections	> An inner court of the Palace, Ulwur. Photograph from an album of 80 albumen prints taken by Eugene Clutterbuck Impey. 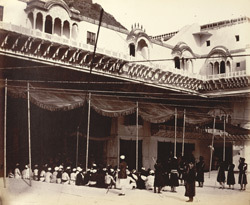 In this view 'The Rao Raja is holding a small durbar or private reception, seated under a canopy, and shaded by an eave-curtain supported on poles overlaid with silver.' The principality of Alwar is in the north-east of Rajasthan, bordering the Delhi region. Alwar town is sited in a valley overlooked by a fortress stretching along the high ridges of the Aravallis to the north-west of it. Alwar's strategic position resulted in it changing hands several times, it was fought over by the Rajputs, the Mughals and the Jats from the 10th to the 19th centuries. However, the city itself is more recent, founded by the Kachhwaha Rajput prince Rao Pratap Singh in the 1770s as the state capital. He had wrested the 10th century Bala Qila Fort from the Jats of Bharatpur who had briefly overrun it. The City Palace or the Vinay Vilas Palace lying below the Fort was begun by his successor Bakhtawar Singh in the 1790s. At the time of Impey's visit (he was actually Political Agent in Alwar in 1858), the Raja was the young Sheodan Singh (ruled 1857-74). The Palace was a collection of buildings in various Mughal-Rajput styles, dating from the Old Court of c.1793 to the New Court of c.1850, and facing a large rectangular reservoir. The buildings now house government offices and a museum which is a storehouse of thousands of Mughal and Rajput manuscripts.